The next question is why widespread outbreaks don't happen in other areas. Filoviruses, first recognized in 1967, usually infect bats but can also be transmitted to humans. While filoviruses do not usually manifest symptoms in infected bats, they have the potential to inflict severely devastating consequences to humans. The more commonly known of the two filoviruses is the Ebola virus which was responsible for the 2014 outbreak in West Africa; the other one being Marburg virus, which is almost indistinguishable from Ebola and is also highly fatal. Because of the alarming risks associated with these viruses, it has been the highest priority to learn more about the viruses, how they spread, from where and from which species—which has been one of the lapses hindering the containment of the disease in the past. And now, a team of scientists from the University of Georgia, Massey University, and the University of California has created an artificial intelligence (AI) model that could pinpoint potential hotbeds for infection by predicting bat species that are highly likely to transmit these viruses. 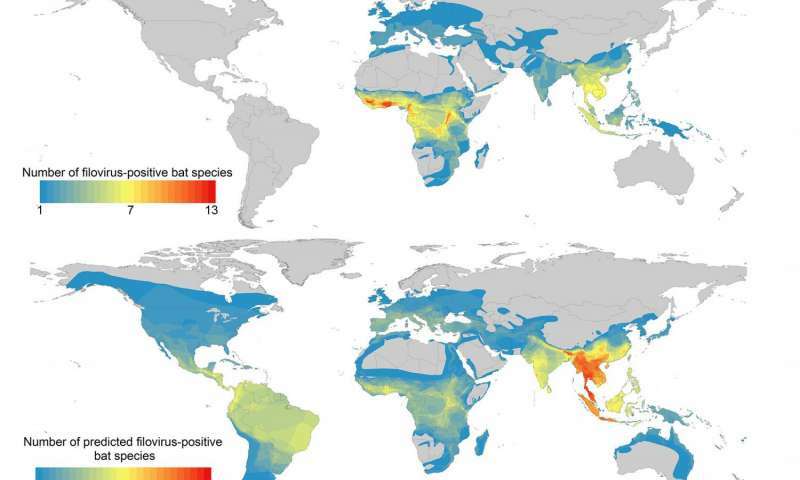 The research provides a pro-active approach to preventing outbreaks by forecasting where virus transmission is likely based on where the carrier bats thrive, instead of only using data about where previous outbreaks have been. The model’s findings, published in the journal PLoS Neglected Tropical Diseases, profiled the 21 known filovirus-positive bat species based on life history, physiological, and ecological attributes. The algorithm was 87% accurate in identifying whether a bat species can harbor filoviruses or not. On top of that, the algorithm was able to widen the scope of areas to monitor beyond sub-Saharan Africa, to Southeast Asia and Central and South America. Han et al. PLOS Neglected Tropical Diseases. John Drake of the University of Georgia says that the next aspect of the study is to find out how the infection seems to be contained in the other areas except in Africa.